There is a fenced-in bird sanctuary to our left. The beach to our right. Over our heads fly terns with the silvery slivers of fish in their beaks. They still manage a squawk as they hop from sea to nests behind the fence. Oystercatchers squat tense over their eggs. Behind a hump of pastel and beige shingle the hazy sea pulses. The terns dive in with enhanced gravity to shock those little fish. We walk through the bunches of waxy seakale. 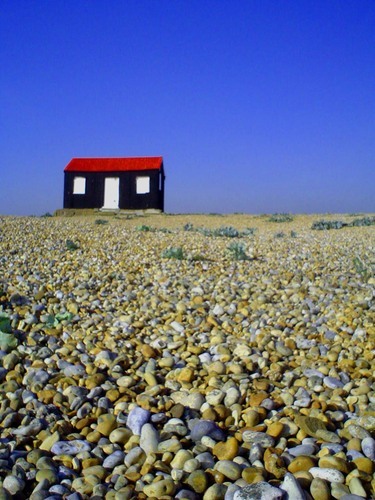 Today you can only smell the sea once you are over the shingle ridge on Winchelsea Beach. This land is a gathering of stones, building a flat promenade stretching out to sea year on year. Towers and bastions mark old wars and old shorelines. But these flats hide nooks of nature and graceful migratory patterns must be protect behind barbed wire. A rusty headland rises out of a beige haze to the west. I wade into the water and that late afternoon sheen runs with the waves over the pebbles. A gentle blast of green wave pumps back and forth making licks and dips in the stones. It smells like mornings after the breakfast shift at the hotel Pelirocco in Brighton. I would rinse the smell of bacon from my skin in the sea, picking my way back to my clothes before the crowds came. There’s a cleaner kind of dirt on me now and that same South Coast smell clinging to the flinty shingles.